There is no single truth behind the mythic figure that first surfaced in Transylvania, Romania, more than 500 years ago. For centuries, Dracula has been alternately revered, vilified and idolized. Romanians recently discovered the marketability of this character who is so creepily attractive to the West. Vlad Tepes, or Vlad the Impaler, was the original Dracula, born into a time of strife between two great powers: the Austrian Hapsburgs and the Ottoman Turks. To some Romanians, the 15th-century prince of Wallachia and Transylvania is still a hero. According to Romanian lore, Vlad was a just man who defended his people from Turkish invaders and German merchants when most surrounding principalities had surrendered to Ottoman rule. The prince insisted that everybody, from the nobles to the peasants, submit to his rules or face dire consequences. The poor who didn't suffer from one of his draconian and frequently capricious acts loved him for this. "Dracula" was the honorific given to Vlad Tepes because, like his father before him, he belonged to the Order of the Dragon, dedicated to fighting Turks and heretics. (The diminutive "a" at the end signified "son of the dragon.") Later, people called him "Dracul," meaning "devil," because the dragon symbolized the devil. A real-life fiend, Vlad the Impaler killed 40,000 to 100,000 people, an unfathomable number at a time when murders were done singly and by hand. A sadist as well as a mass killer, Vlad had his victims blinded, strangled, hanged, burned, boiled, nailed and buried alive. Vlad once noticed that there were many vagrants, beggars and cripples in his kingdom. He invited all the poor and sick in Wallachia to a great feast, proclaiming that no one should go hungry in his land. The poor and crippled were brought into a vast hall where a fabulous feast was prepared for them. The guests ate and drank late into the night, when Vlad appeared and asked the assembled crowd, "Do you want to be without cares, lacking nothing in this world?" When the answer was affirmative, Vlad boarded up the hall and had everyone within fried to a crisp. Vlad explained his action by saying, "No one will be poor in my realm." One of Vlad's more infamous victories was over a Turkish sultan who was in hot pursuit of him. According to Greek historian " ... the Sultan's army came across a field with stakes, about three kilometers long and one kilometer wide. And there were large stakes on which they could see the impaled bodies of men, women, and children, about twenty thousand of them, as they said; quite a spectacle for the Turks and the Sultan himself! The Sultan, in wonder, kept saying that he could not conquer the country of a man who could do such terrible and unnatural things ... ."
Vlad's infamy spread far even during his lifetime. He was called "the wild beserker, Prince Dracula" by the Germans. German pamphlets with titles like "The Frightening and Truly Extraordinary Story of a Wicked Blood-Drinking Tyrant Called Prince Dracula" were sometimes illustrated with portraits of the dark prince and his atrocities. But, although he purportedly forced gypsies to eat each other, Vlad himself never drank blood. Vlad's death remains mysterious: Various legends say that he was mistaken for a Turk and killed by his own men, that he was killed by a hired assassin, that he was killed by a political rival. In any case, an exhumation of his grave site in the 1930s did not yield a body. Before Bram Stoker's 1897 novel Dracula, Romania was haunted by plenty of "undead," but it took an intellectually larcenous Irishman with a big imagination to create the Dracula myth. 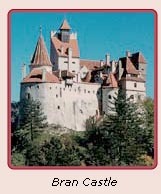 Stoker's creation was originally going to be called "Count Wampyr," but was changed to "Dracula" after Stoker read a footnote stating that the name meant "the devil" in the Wallachian language. Stoker married the name to the Transylvanian idea of vampires that he had read about in a different text, and the Count Dracula of Western nightmares was born. Count Dracula stalked his victims at night, killing them by draining their bodies of blood. He had the strength of 20 men, subsisted on the blood of others, could shape-shift into a wolf or bat, had no reflection or shadow, and could transform others into vampires. He did have his limitations, however. Count Dracula could not enter a house unless invited, lost his supernatural powers during the day, and had to travel to England with seven boxes of soil from Transylvania because he had to sleep on native ground. He met his end stabbed through with a knife. "I am Dracula," intoned Bela Lugosi in the classic 1931 film Dracula. Lugosi was not the first choice of Universal Films in its quest for a screen Dracula. 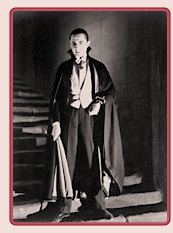 But Lugosi, who was already playing Dracula on the stage, was driven to get the part. He bombarded studio executives with so many letters and telegrams that in the end they had no choice but to let him play the role he felt destined for. For the movie's opening night, one New York City theater advertised that a trained nurse would be available to care for those who fainted from terror. Dracula was a huge success and was followed by a sequel, Dracula's Daughter. When he died, Lugosi was buried with his Dracula cape from the movie. On Sesame Street, Count Dracula is an obsessive, purple number-counter with pointy ears and a bad Romanian accent. He loves to count and must count everything from bats to biscuits. Fortunately, he only counts to 20. Seducer and killer, giver of immortal life and taker of humanity, the vampire Lestat is novelist Anne Rice's most enduring character. More than 100,000,000 copies of her books have sold worldwide. The Lestat first introduced to the public in Rice's 1976 Interview With the Vampire was a darker, colder, simpler character than the vampire who emerged almost a decade later in The Vampire Lestat. True to his immortal nature, Lestat survived Rice's attempt to kill him off in a fire in Interview. In the second novel, Rice introduced a vampire-as-artist, a wanderer with the charisma of a rock star. The new Lestat ignited readers' passions and gave birth to fierce fan clubs, cult gatherings and pets named Lestat. Even today, many Romanians have never heard of Dracula in the Western sense of the figure. But enterprising Romanians trying to lure Western tourists are learning that vampires sell. Dracula Land is a proposed theme park intended to bring fame and fortune to a small town in the middle of Romania. The park was meant to capitalize on the history of Sighisoara, haunt of Romanian prince and folk hero Vlad the Impaler, and to link Vlad, erroneously but dramatically, with vampire images from Western pop culture. Dracula Land has drawn opposition from cultural conservationists like Prince Charles (who also shares ancestry with Vlad). According to the United Nations Education, Science and Culture Organization (UNESCO), the "cultural value" of Sighisoara would be damaged by the addition of a Disneylike theme park. Complaints of preservationists and environmentalists have temporarily postponed the groundbreaking for Dracula Land, originally scheduled for 2002. Romanian tourism minister Matei Dan insists, however, that the park will "certainly open in 2004." Not to be outdone, the town of Brasnov recently announced plans for a competing version of Dracula Land, to be called Empire Dracula. Vampires are generally believed to be some form of dead person feeding off the living in order to preserve their own immortality. Vampires are not a strictly Romanian phenomenon; they are globetrotters who, in one form or another, have haunted regions as diverse as ancient Egypt, Tibet, Mexico, the Philippines and China. Romanians, though, have a particularly lively and robust tradition of vampire stories. Tales abound of strigele, moroii, varcolaci and pricolici ‚‚ all forms of reanimated corpses or vampires. The following tales come from The Vampire: A Casebook, edited by Alan Dundes. Copyright 1998. Reprinted by permission of The University of Wisconsin Press. "Some twenty or thirty years ago (in the early 1900s), a cripple, an unmarried man, of Cusmir, in the south of Mehedinti, died. A little time after, his relations began to die, or to fall ill. They complained that a leg was (sic) drying up. This happened in several places. What could it be? 'Perhaps it is the cripple; let us dig him up.' They dug him up on a Saturday night, and found him as red as red, and all drawn up into a corner of the grave. They cut him open, and took the customary measures. They took out his head and liver, burnt them on red-hot cinders, and gave the ashes to his sister and other relations, who were ill. They drank them with water, and regained their health." -- Agnes Murgoci, "The Vampire in Roumania"
"There were once two partners, a thief and a vampire. 'Where are you going this evening?' said the thief to the vampire. 'I am going to bewitch the son of Ion,' said the vampire. 'Don't go there. It is there that I want to go this evening to steal oxen. You can go somewhere else.' 'Go somewhere else yourself,' said the vampire... Both of them went. The vampire went to the door, and the thief to the window. Ion's son inside sneezed, and the thief said quickly, 'Long life.' This took away the vampire's power. He was able to make the boy's nose bleed, but (the boy) did not die. The thief then went in and told the parents what had happened, and they gave him some oxen as a reward. It is always well to say 'long life' when anyone sneezes." -- Agnes Murgoci, "The Thief and the Vampire"
From the village of Nucsoara, Muscel district: "Once a strigoi turned into a handsome young man and a young girl fell in love with him. They were married, but the girl also wanted a religious wedding. He rejected this idea. Her parents insisted, so he agreed to go to the church, but when they emerged from the church he looked at his wife in a strange way, baring his teeth. She became frightened and told her mother about it. Her mother said, 'Don't be afraid. He loves you. That's why he bared his teeth.' When their parents came to visit them, they couldn't find them. They had locked themselves in, but the people could see them through the window. He was sucking her blood. When the people saw it, they shot him through the window. (recorded 6/21/1936)"
-- Jan Louis Perkowski, "The Romanian Folkloric Vampire"
Dracula: The Metamorphisis of a Fiend by Jessie Deeter, an Associate Producer for FRONTLINE/World. QUIZ - Do you know how to spot a "Vampire"? Photo: Tom Cruise as the vampire Lestat in the 1994 film adaptation of Anne Rice's "Interview with the Vampire"